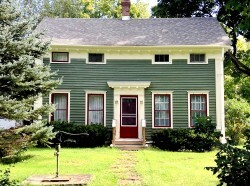 Situated in a hamlet on East Hill, in the town of Cherry Valley – 5 miles from the village, 4 miles to Sharon Springs, 17 miles to Cooperstown, 50 miles to Albany. A 1500 sq ft home with a fully equipped kitchen; snacks, coffee, tea, seltzer, provided. Downstairs: parlor, living room, dining room & full bath. Outside deck with bbq grill. Two upstairs bedrooms, one with an en suite bathroom. It is a quiet, private and relaxing location. Nonsmokers only. No pets. 110.00 a night (plus sales & occupancy tax) two night minimum.